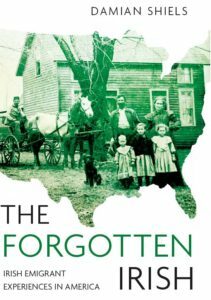 The battlefields of the American Civil War claimed thousands of Irish Famine emigrants. The families of some were fortunate, in that comrades took the time to write to them of their loved one’s final moments. But these letters did not always spare grieving relatives the gruesome imagery of war. Thankful as they must have been to receive them, one wonders to what extent the imagined final moments of husbands, sons and brothers were replayed and visualized in the minds of those left behind. Such may well have been the case for Mary Clark, from Co. Westmeath, when she received word on how her husband had lost his life on the slopes of Culp’s Hill, Gettysburg. The part of West 18th Street on which the Clarks lived, as it appears on Google Street View. Owing to the absence of the officer in command of Co “B” I will endeavor to answer your letter regarding you husbands death. Corporal John Clark Co “B” 1st U.S. Chausseurs was struck with a piece of shell on the morning of the 3d day of July at 11 o’clock. The regiment was laying down awaiting the order to advance to the front when a shell exploded over the Reg’t killing him and wounding another man by his side. One of his comrades carried him off the field to the Hospital and if he said any thing to him I cant say as he was wounded soon after and while on his way to join his Company and no word has been heard from him. 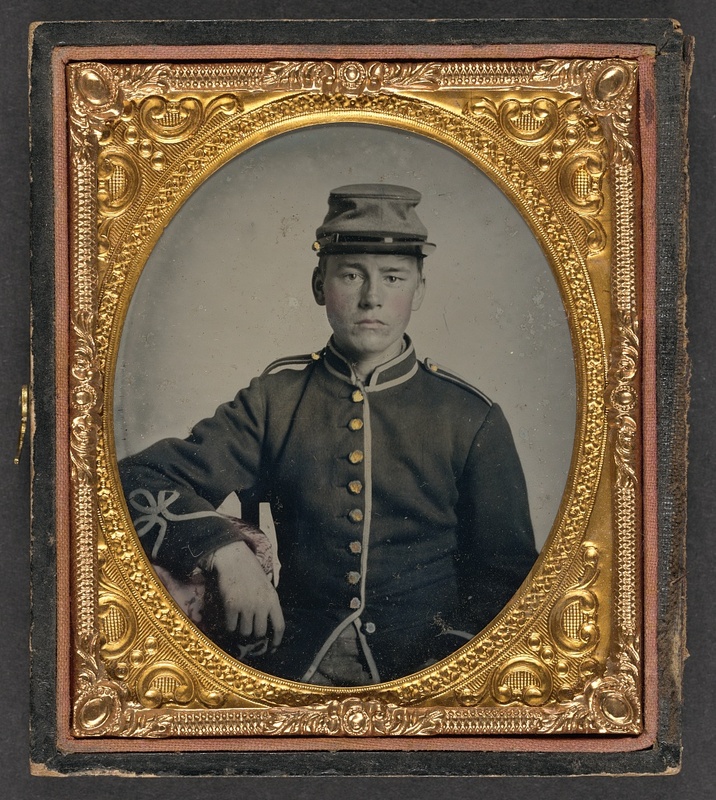 John’s own officer is now in New York for conscripts with his Head quarters at 274 Canal Street in the store of the Water Furnace Company. I will write him a letter and give him you direction so he can call and see you if he has time. You would do well to call and see him and he probably may assist you in getting the relief money. I came out in the same Company with your husband as a Sergeant and I have had good chances of knowing the man and I but speak the feelings of all his comrades in saying that a better soldier, companion or friend was not to be found in the Regiment and all his comrades deeply sympathize with you in the loss of such a husband– If there is anything his comrades can do they wish me to say they are at your service and if any further information is needed I will cheerfully grant it. 274 Canal Street, the site of Brown’s Water Furnace Company, as it appears today. It is likely that Mary Clark visited Lieutenant Raymond here in 1863 to find out more about her husband’s death at Gettysburg. Promoted Captain to date from 1st July 1863, Raymond was dismissed on 7th March 1864 for being absent without leave. It is with regret I announce to you that your husband was killed in the Battle of Gettysburg the 3rd of July at about 11 O’clock. He lingered for about 4 hours when death put an end to his sufferings. He was universally beloved in the regiment, but more particularly in our company where he was better known. By his death the regiment loses the services of one whose place it will be difficult to fill. In passing this tribute to his memory I but re-echo the sentiments of the entire command. I sincerely sympathize with you in the irreparable loss you have sustained, whereby you have lost a kind husband, and your children an affectionate father. May his soul rest in peace. Our Lieutenant whose is name is George S. Raymond is in your city detailed to bring on conscripts. I think you will find him at the Howard House or somewhere in that vicinity. He can give you more information than I possibly can give you on paper. Your husband was laying on his back calmly talking of the “Union” when a fragment of a shell struck him nearly taking both legs off. Wishing your sorrows may be alleviated by the consolation of knowing he died a glorious death. John Clark Widow’s Pension File WC50400. Census of the state of New York, for 1855. Microfilm. New York State Archives, Albany, New York. [Original page scans accessed via ancestry.com]. Civil War Muster Roll Abstracts of New York State Volunteers, United States Sharpshooters, and United States Colored Troops [ca. 1861-1900]. (microfilm, 1185 rolls). Albany, New York: New York State Archives. [Original scans accessed via ancestry.com]. Official Records of the War of the Rebellion Series 1, Volume 27, Part 1. Reports of Brig. Gen. Alexander Shaler, U.S. Army. commanding First Brigade , Third Division. Pfanz, Harry W. 1993. Gettysburg: Culp’s Hill & Cemetery Hill. New York Adjutant General. Roster of the 65th New York Volunteer Infantry. 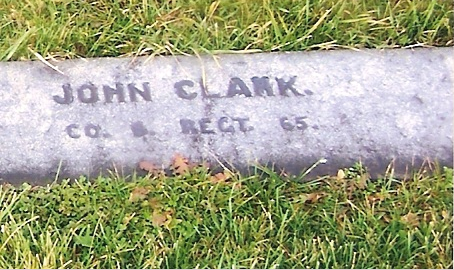 Corporal John Clark Find A Grave Memorial. Art and Picture Collection, The New York Public Library. 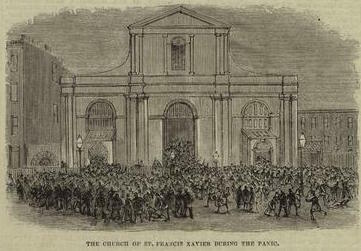 “New York City:the fatal panic, on the evening of March 8th, in the Church of St. Francis Xavier, Sixteenth Street, between Fifth and Sixth Avenues.” New York Public Library Digital Collections. Accessed March 3, 2016. Pat Callahan Find A Grave Contributor. Civil War Trust Battle of Gettysburg Page. One has to wonder why the second letter writer felt the need to describe the grim details of Clark’s death to his widow. I can understand detailing the manner of death, but to add that he nearly had his legs taken off seems gratuitous and the sort of thing that any man with a wife or mother would know better than to include. Of course, it was a different time and death, especially during the war, was common. I suppose it is striking a balance between shielding people from the realities and telling them the truth- of course we don’t have the other side of this correspondence, so it may well be that she explicitly requested more detail.